Home > Sports & Performance > Can Green Tea Supplements Improve Metabolism? Most of like to sit down to a nice, hot cuppa now and then. But did you know that having a cup of green tea can help you do more than just relax? Recent studies have shown that a cup of green tea can actually help us lose weight – if we forsake the biscuits and cakes that usually accompany it! Everyone know the best way to lose weight: exercise more and eat less. Now there is a safe way to actually increase the amount of energy we expend, which is a way we measure our metabolism. In clinical studies carried out in Switzerland but published in the American Journal of Clinical Nutrition, men who took regular extracts of green tea were found to have an increased metabolism, and their bodies were better at fat oxidation. Additional studies have found that the caffeine and polyphenols – chemicals with strong antioxidant properties - in green tea worked together to increase thermogenesis, or the rate at which we burn calories, which will eventually result in weight loss. Drinking green tea or taking green tea extracts also helps to improve fat oxidation. Interestingly, people did not have the same results just by increasing their rate of caffeine alone. In addition, their heart rate did not increase after drinking green tea, which shows it may be safer than others when used as a diet aid. Archaeological evidence says it's possible that people were brewing their own teas as many as half a million years ago. While India and China were among the two main countries to make tea a popular drink, millions of people worldwide drink this nutritious brew today. Green tea, in particular, is now seen as having a plethora of health benefits. In Chinese medicine, tea originally was seen as a medicinal herb, used to clear one's head, reduce phlegm, aid digestion and increase urination, therefore cleansing the body of toxins. Green tea today is a popular drink all over the world, not only due to its refreshing taste but also due to the medicinal and health qualities of this incredible leaf. In recent years decaffeinated green tea has become popular, making it available to an even wider audience. Green tea is always prepared from unfermented leaves, as the longer the leaves ferment, the more they lose their effect from polyphenols and the higher the amount of caffeine. That's why black tea, which is fermented much longer, has as much as three times the level of caffeine that green tea has. Usually green tea is sold as a leaf, which can be brewed at different strengths. Extracts made from the leaves and buds are also sold, as well as capsules and liquid preparations. A cup of green tea can contain anywhere from 50 to 150 mg polyphenols, with decaffeinated tea also containing a large amount. Ask your doctor before taking nutritional vitamin supplements of any kind as they can interact with other supplements and with prescribed medications. 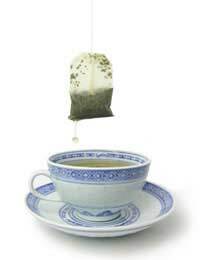 Green tea, for example, should not be taken with aspirin as together they can cause excess bleeding. Green tea can also interfere with medications for irregular heartbeats and anxiety; antibiotics; some oral contraceptives; blood thinners; ephedrine; some cough medicines and more.